You might be feeling down that you missed out or envious others around you have hit the jackpot. Thatâ€™s a normal feeling. Those types of emotions are the fuel that drives speculation. Our advice on speculating in Bitcoin (if you canâ€™t resist the temptation) is the same as the advice we would give on investing in any other undiversified risky asset like individual shares, equity crowdfunding or art. You should still follow a sensible investment process to give you the best chance of success. First, stay well clear if youâ€™re not in the financial position to be speculating in the first place because you have debts or expenses coming up. Do not borrow money to speculate. I repeat: do not borrow money to speculate. If you insist on speculating itâ€™s wise to limit your exposure in any bet like Bitcoin to 2% of your wealth or less. If it doesnâ€™t work out you wonâ€™t be devastated financially. And if it does work out then you have our full permission to gloat, be smug and merry. Only betting a small amount of your total savings means you wonâ€™t feel forced to sell if there is a big fall. With risky investments itâ€™s worth dollar cost averaging rather than buying your entire amount at once. Buying small amounts over time is obviously more difficult with some assets (like art) but can be done with individual shares or Bitcoin. By dollar cost averaging you can reduce the chance of being sucker who bought at the top because of FOMO. Like the people who bought Amazon in 1999 for $110 had to wait 10 years to get to breakeven. It improves your chances of doing well in the long run if you are eventually right, because it reduces the impact of market timing. Trying to time the market is dangerous because the most tempting time to buy is usually the time you shouldnâ€™t be. In most cases with Bitcoin exchanges you donâ€™t own the underlying instrument, youâ€™re relying on someone to hold and manage it on your behalf. This adds an extra level of risk â€“ called counterparty risk. Some bitcoin exchanges have gone bust, many bitcoins have been stolen and little protection exists in this area for consumers. Fast rising markets like Bitcoin and other cryptocurrencies attract fraudsters, financial cowboys and hidden dangers. If it sounds too good to be true, it almost certainly is. You should know whether you own the underlying instrument or a derivative over it like a futures contract, CFD or fractional unit. Understand your â€˜counterparty riskâ€™ and what protections you have (if any). Rebalance â€“ aka lock in some of your profits. If youâ€™re lucky enough to make outsized gains in any speculative investment, donâ€™t forget to rebalance. Itâ€™s one of Stockspotâ€™s core principles for managing and growing wealth over time. Investments grow at different rates and then tend to revert (i.e. fall) back to average over time. When you invest with us, we periodically rebalance your portfolio to harvest returns and keep risk in check. Basically we sell some assets that have done well and buy some that havenâ€™t. The same should go for Bitcoin or other speculative investments. Letâ€™s say you bought at the start of 2017 when Bitcoin was trading at $1,000 and allocated 2% of your wealth. With Bitcoin now trading at $19,000 it has probably grown to around 26% of your savings which is a much bigger part of your portfolio. Great work! 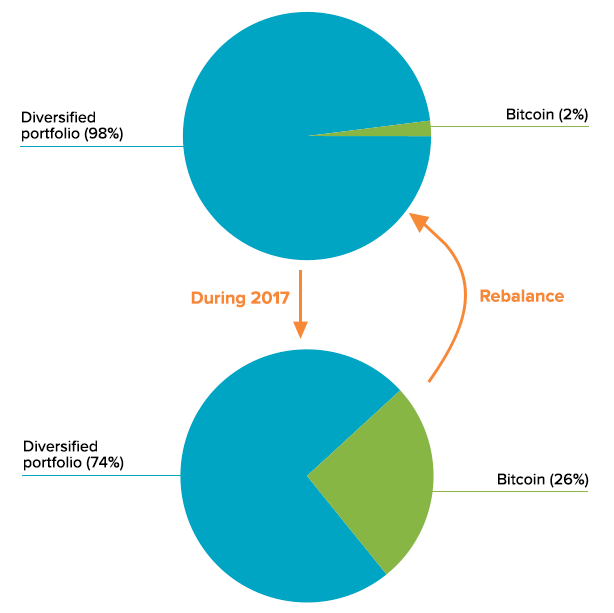 To ensure you keep a good level of diversification and reduce your risk, itâ€™s probably a smart time to rebalance. If youâ€™re holding out for a higher price, our advice would be donâ€™t wait â€“ at least sell some to minise the potential for regret. One way to think about it is to consider how you would feel if it fell 80%. If that would make you feel regret for not selling some, then you should. Remember, nobody ever went broke taking a profit. Trying to time the market brings human emotions into play. Thatâ€™s why we automate the rebalancing process for clients â€“ to remove the dangerous tendency to â€˜follow the crowdâ€™. Itâ€™s always hardest to sell when markets have risen because thatâ€™s when everyone is most optimistic. Watching prices go up and down on a daily basis will almost certainly cause you to buy and sell too often and destroy any long term gains. If youâ€™ve followed the above rules, be confident in your process and ignore the daily noise because itâ€™s irrelevant in the long term if Bitcoin is successful. Put it in the bottom drawer, so to speak, and get on with your life. Speculation can be fun to watch and exciting to participate in because it shares more in common with gambling than investing. If you want to speculate on Bitcoin or any risky investment, stick to a disciplined process. Have a small position size, dollar cost average, rebalance to reduce your risk over time, and ignore the noise along the way. Following these steps will give you the best chance of long term success and prevent your investment from becoming a financial catastrophe. If youâ€™re not planning to jump on the Bitcoin bandwagon, thatâ€™s perfectly fine too! We think a mix of low-cost diversified ETFs is a smarter (and less emotionally exhausting) way to invest.